← Opposition 2013 – CGEM success! After six days of travel by car my body is a right mess, but I made it to the Blue Mountains of Ontario in one piece (dodged four moose on the drive between TBay and the Soo!). The E.C. Carr Astronomical Observatory (CAO) is owned and operated by the RASC Toronto Centre, and fully accessible to all members with nominal day rates or a really inexpensive yearly pass of $75. I worked out my first visit from afar, thanks to Blake N, and Phil and Lora C, who have been wonderfully welcoming! Let me just say this place is fabulous, and exactly what I needed to wind down such a busy academic year and begin my summer of Saturn chasing. Phil offered that I set up my CGEM in the main observatory, since noone last night was using the scope in there, and there was plenty of room. Phil confirmed that probably I am being too finicky with polar alignment given that the computerized mount will run an efficient routine – but darn it, now that I know how to use that polar finder scope, I’m being stubborn about using it. Phil also gave me some tips on general handling and maneuvering, which is extremely helpful. Everything was fine until I powered up the mount to run through the 2-star alignment routine. The scope kept slewing to nothing (thinking it was slewing to something), and this reminded me of my Wrong Silo Blues experience. Turns out I had both the time zone and standard/savings settings mixed up, and with that sorted out, all was well. I didn’t manage to post two weeks ago when I visited the URegina Lifelong Learning Centre and gave a lecture on astro-sketching to Chris Beckett’s class. Mike O and I each set up outside and I managed to run through the whole routine on my own without assistance, so that was a huge breakthrough for me. Saturn is so pretty. Dietmar and Phil joked with me about how *not* good the viewing conditions were, but everything is such a wonder to me that I don’t quite care yet. I could make out banding on the planet, and the Cassini Division would pop in and out of resolution, with the 24mm, and the 12mm (though too much magnification for the skies). I thought I could make out the subtlest hint of ring shadow on the planet, just a subtle and thin dark line, but Dietmar was unconvinced (averted imaginary vision is what I think he called it :)). Millie suggest some Messier objects; we began with M13, with the 12mm, but quickly changed to the 24mm for more context, as Phil suggested. 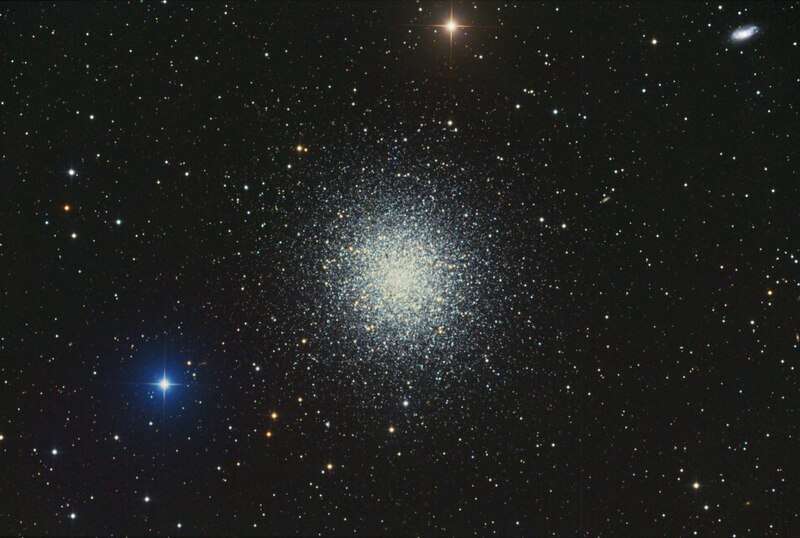 What a pretty sprinkling of globular nebular stars! We also looked at M57. 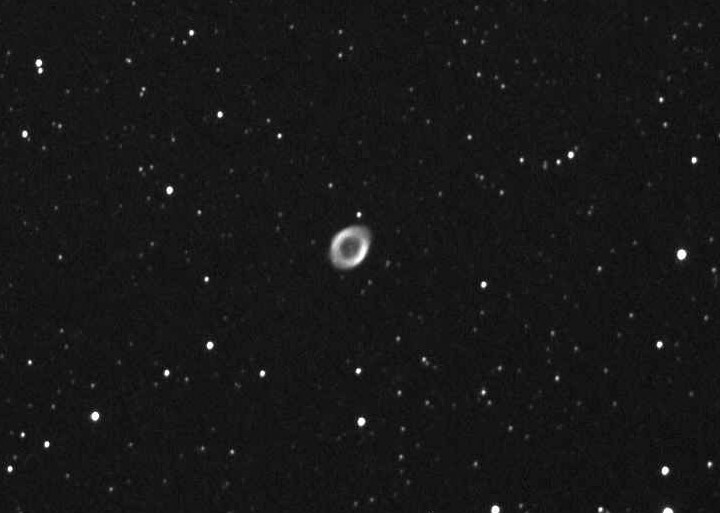 In the picture linked < M57, a planetary nebula, is quite contrasty, but in the scope it was diffuse and really flat. The first glimpse I took I could make out the donut shape and inner circle with great clarity, but the more I looked, the harder it was to see (a very odd characteristic of vision, might as my optometrist about this). I attached my camera at prime and took a couple of snaps (will go grab the card…not worth posting), and by the time I re-attached the hyp24 and camera the clouds rolled in. I am very frustrated with the Nikon T-ring: it does not attach/unattach from the bayonette mount as easily as it should and I worry that I might be damaging the camera. Will need to take a better look in daylight. I learned how to hybernate my cgem, and I suppose I’ll find out tonight how well that works, if I don’t need to relocate my scope (since more members are joining us here today). All that in a day, from the Soo to the CAO. It is fantastic here. And I wonder what the seeing will be like tonight!